This day has really gotten away from me, lets not count the ways. This card was going to be for 6 challenges, but when I looked at my list I always seem to forget that Danni over at Flutter By Wednesdays wants butterflies, fairies, or angels on Wednesdays, and why I forget when it's called Flutter By Wednesday, haven't figured out yet. 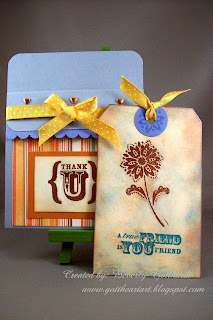 Supplies: Pocket Card from instructions on SAS Project Tuesday, Papers: Stampin Up, Manilla Tag: Staples, My Mind's Eye: MMEBK1, Stamps: Stampin Up: True Friend, Ink: CTMH: Z2160 Twilight, Vibrance: Blue, Ranger Distress Ink: tea dye, VersaMark Ind pad, Judikins: Metallic Copper embossing powder, Elmer's copper leafing pen, EK Success: corner rounder punch, 1" circle punch, scalloped scallop border punch, American Crafts: ribbon, tiny heart brads, Scor Pal Tape, hole punch. Gorgeous thank you card; love the tag idea! Oh Good for you!1st place well done! Wow, five in one and a great card at that! Love that you made it into a pocket card, thanks for playing along in my sketch challenge!